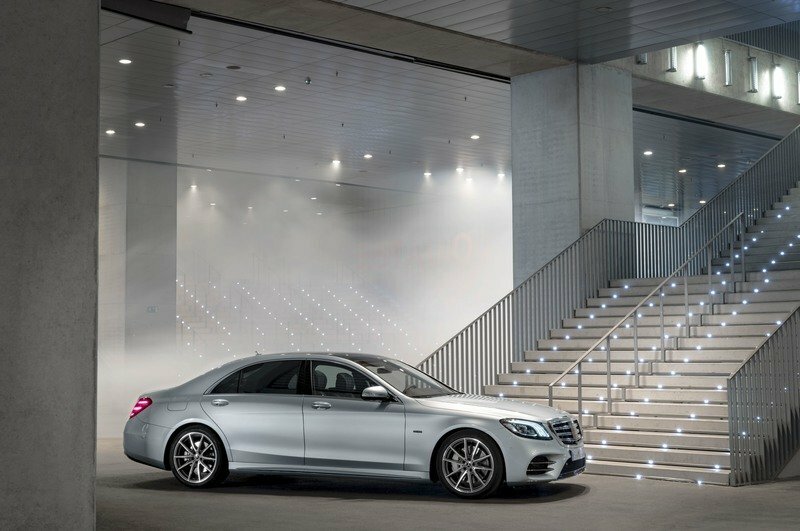 The S-Class – previously known as the “Special” Class – is Merc’s full-sized coupe and sedan, a flagship luxury vehicle that promises the highest levels of refinement, the finest materials, and the most advanced technology offered by the German automaker. Following its reintroduction in 1972, there have been six generations of the S-Class, with the latest generation introduced for the 2014 model year. But now, the calendar is telling me the date is 2017, and all that luxury, technology, and opulence can be had with some green sensibilities as well. Merc’s latest entry in this segment is the S 560 e, the successor to the S 550 e, which once again seeks to find a balance of both long range and a local emission-free motoring, all with that characteristic Mercedes gloss. The S 560 e just broke cover at the Frankfurt Motor Show, and it when it hits U.S. dealers in 2019, it’s expected to arrive with a twist-happy 3.0-liter V-6, 25 miles of all-electric range, a nine-speed automatic transmission, and plenty of Eco-focused features, plus all the traditional luxury bits, of course. 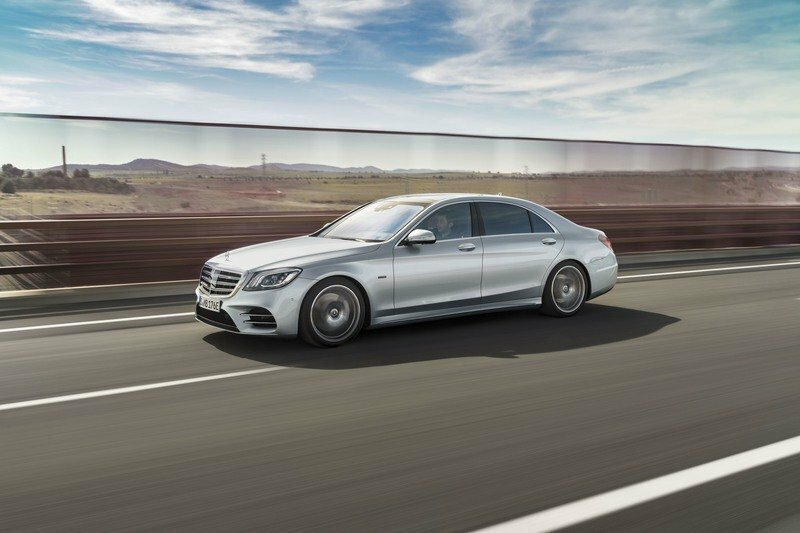 The S 560 e Plug-In Hybrid is the latest effort from Mercedes as it pushes for more extensive electrification across its entire lineup. Both all-electric vehicles and hybrids are slated to see a big boost in the Merc portfolio, so expect to see the same stuff previewed in the S-Class trickle down to the more accessible models. 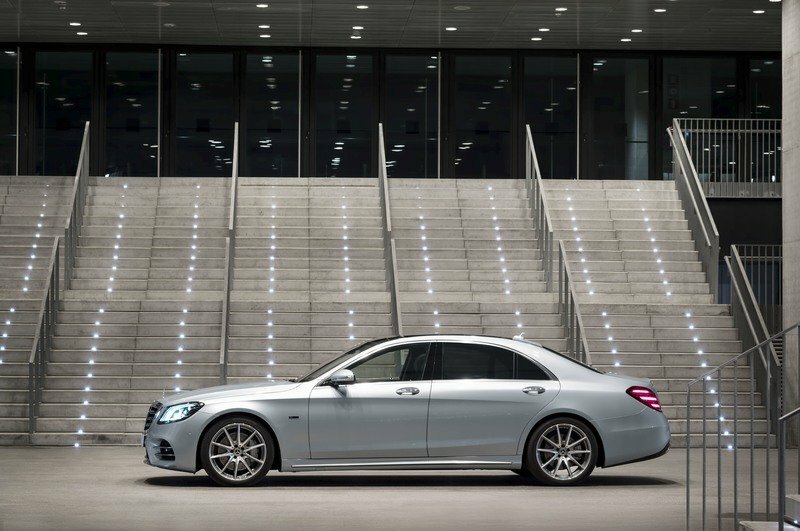 Continue reading to learn more about the Mercedes-Benz S 560 e Plug-In Hybrid. Stylistically, the S 560 e Plug-In Hybrid looks essentially identical next to its un-hybridized brethren. The same minor updates seen in the 2018 model year refresh are all present as they were before, including tweaked trim and reshaped bumper styling. 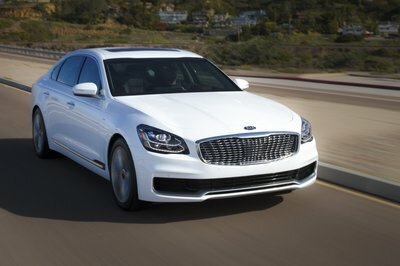 In front, the S 560 e gets a broad, chrome-lined grille with three horizontal slats, which is set between headlight housings with a rhombus shape. Inside each of the headlight housings is a trio of checkmark-shaped daytime running lights, which run across the top of the projectors like eyebrows. Three lower intakes take up residence in the lower half of the fascia, with the two side intakes divided by twin horizontal wings. Moving to the profile, we find additional chrome trim added to the window surrounds, plus a long hood line and short trunk. The stance is low, sitting hunched over large-diameter multi-spoke alloy wheels. The proportions are almost three-box in form, but with a more cab-back angle for the rear half of the car. It’s an attractive look, no doubt about it, and indeed, there’s very little indication this thing is hybridized – beyond a few badges and a potentially soundless drive, that is. 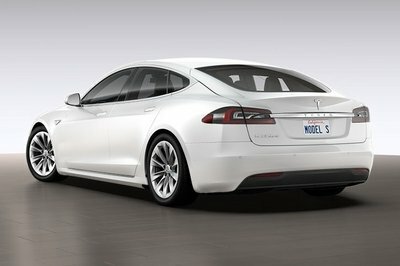 In back, the tail is rectangular in its shape, with taillights that fold into the rear quarter panels. The exhaust tips are once again set in a rhombus shape, and also come outlined in chrome. It’s an attractive look, no doubt about it, and indeed, there’s very little indication this thing is hybridized – beyond a few badges and 25 miles of soundless drive, that is. And that’s a good thing, because while eco sensibilities seem to be a mark of pride amongst a few entries of the commuter class (Toyota Prius, Chevrolet Volt, etc. 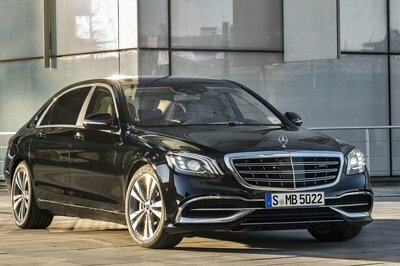 ), Mercedes is taking a more subtle approach with its top-shelf entries like the S-Class. No need to shout about it, right? 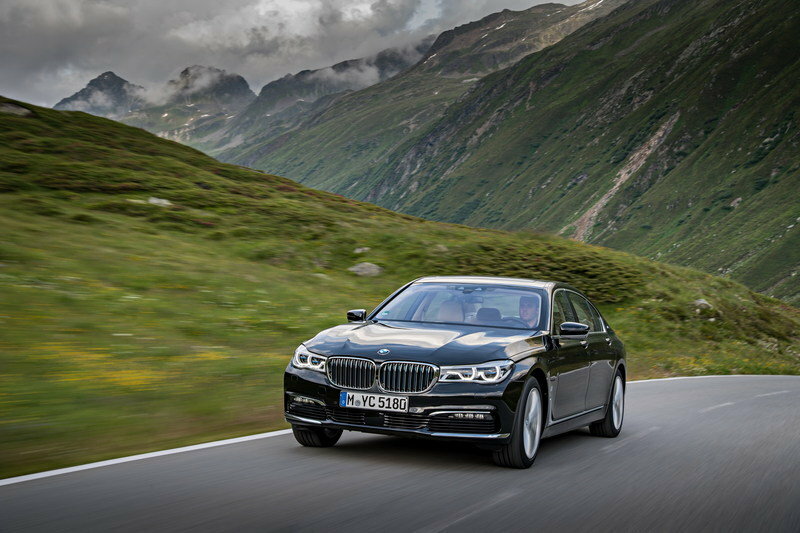 Note: Audi A8 pictured on the left, BMW 740e xDrive iPerformance pictured on the right. When looking for competition for a Mercedes model (any of ‘em, really), look no further than the other two names in the Big German Three – Audi and BMW. First up, Audi with the A8. 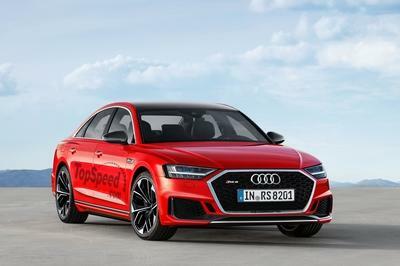 This mega-sedan from the Four Rings gets the very latest Audi styling language, which means lots of sharp angles, chiseled features, and a long, wide, low stance. Up front, Audi’s characteristic Singleframe grille dominates the fascia, with chrome trim added pretty much wherever possible. In back is a subtle trunk lid spoiler, which looks good with the horizontally drawn-out taillight housings. LEDs are used in the headlights, with further LEDs connecting the taillights in the rear. While style and aesthetics are a matter of opinion, our nod in this particular beauty contest goes to the Mercedes. 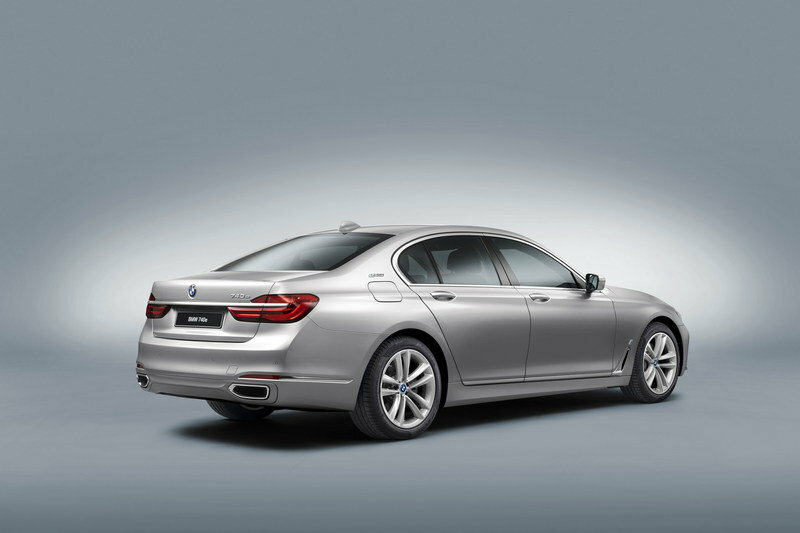 Next up is the BMW 740e xDrive iPerformance. 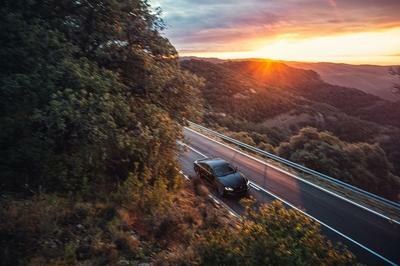 Just as the letter “M” denotes Bimmer’s faster, sportier models, the letters “i” and “e” denote electrified power and efficiency (the i3 and i8 both come readily to mind). 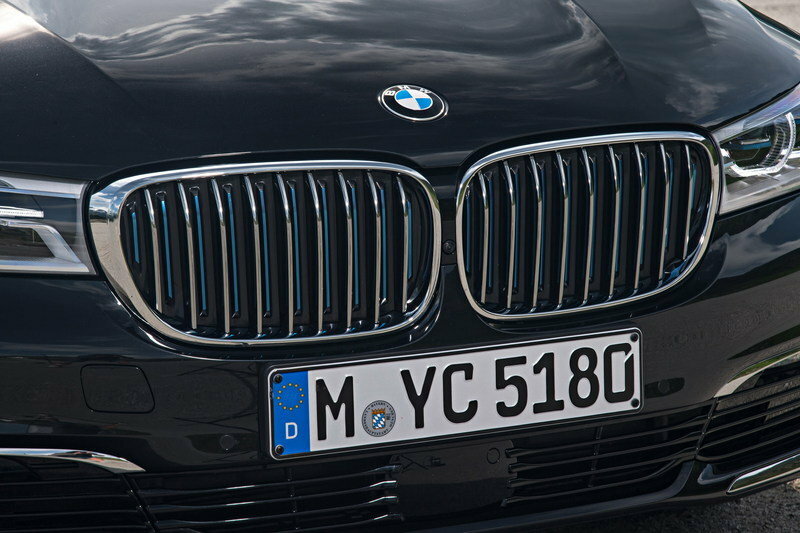 Unlike the Mercedes, BMW is a little quicker to show off its eco cred with the 740e, adding a blueish hue to the fascia with extra slats in the kidney grille and new lines inside the headlight housings. Additional badging adorns the exterior. The headlights also get LED lighting elements. While style and aesthetics are a matter of opinion, our nod in this particular beauty contest goes to the Mercedes. We like the subtlety and refinement, and would generally prefer to see the S-Class in our driveway over the A8 and 7 Series. 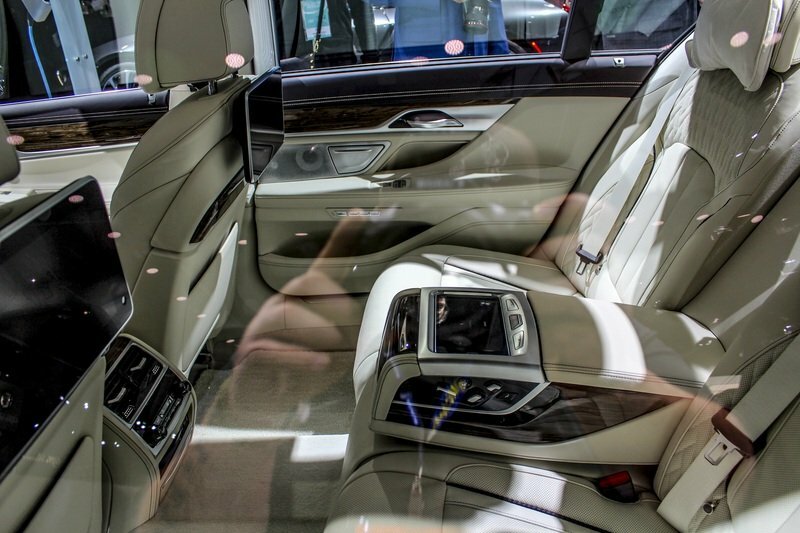 Inside the S 560 e, you’ll find the same attractive cabin layout as the ICE-only iteration. The dash is broad, wrapping around the occupants with a wave of wood trim and leather upholstery. The seats get a quilted diamond pattern, while rounded vents are scattered throughout. A large digital display stretches from behind the flat-bottom steering wheel and above the center console. High-end audio provides the tunes, while options include a heads-up display. The upgrades for hybrid efficiency are integrated rather seamlessly. For starters, the onboard infotainment provides hybrid driving efficiency suggestions – for example, if the car is approaching the speed limit, the car will notify the driver to let off the throttle to help ease into coasting. The latest hybrid components were also made smaller in order to maximize cabin and trunk space, with trunk space increased from 395 liters (13.9 cubic feet) to 410 liters (14.5 cubic feet). The upgrades for hybrid efficiency are integrated rather seamlessly. 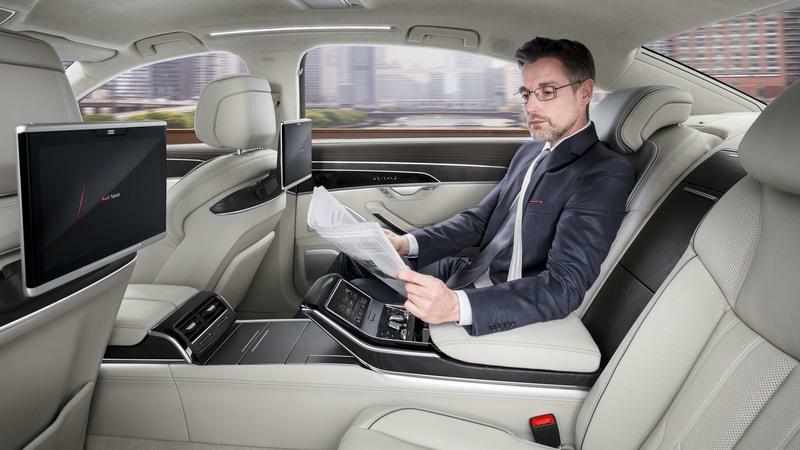 For starters, the onboard infotainment provides hybrid driving efficiency suggestions. However, it’s not all about efficiency with this Mercedes, as the hybrid system also enables a few high-end luxury features as well. For example, standard spec includes pre-entry climate control. This feature basically sets the various temperature settings (air conditioning, heater, heated seats, steering wheel heater, armrest heaters, and optional seat ventilation) for maximum comfort prior to setting off. Just put in your preferred departure time and temperature settings using the Mercedes me app, and the cabin will be nice and comfy the second you climb into it. Inside the new A8, Audi updated quite a few things with its latest refresh. Like the Merc, there’s a surrounding trim line of high-end wood, while glossy piano black surfaces adorn the lower console and center console. The steering wheel is a rounded, multi-functional affair with thumb-length buttons, while behind the steering wheel is a digital display. Brushed metal trim was added for the surrounds. The seats get both heating and ventilation settings. 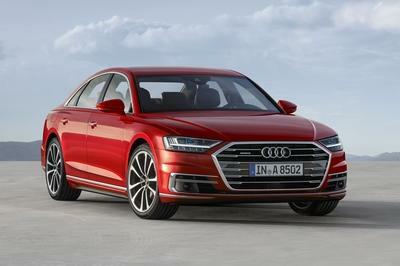 Further features include navigation and a LTE Wi-Fi hotspot, plus Audi’s latest traffic jam pilot. 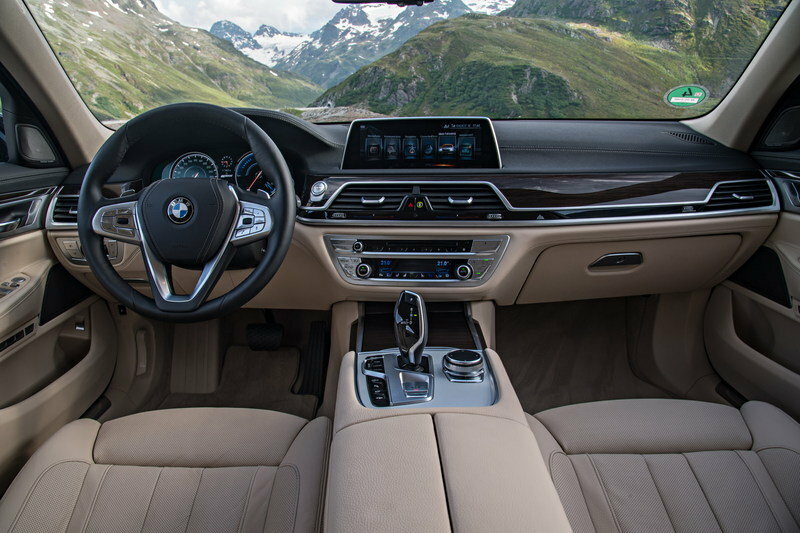 The BMW 740e xDrive is also a rather nice place to sit, once again offering wood, leather, and brushed metal trim. The seats are nicely bolstered, yet comfortable, while digital displays (one behind the steering wheel, another on top of the dash) provide the info. The cluster display measures in at 12.3 inches, while the console screen is 7 inches. The iDrive 5.0 infotainment platform controls it all, and offers support for gesture control. A 16-speaker stereo from Bowers & Wilkins Diamond makes the music. All things being equal, we’d probably once again gravitate to the S-Class in terms of interior comfort. We like the layout a lot, and definitely get a sense of being in a “premium” environment. It’s modern but refined, and although the Audi and Bimmer are both quite nice in their own way, the Merc just takes the cake. The main motivator under the hood of the S 560 e is a 3.0-liter V-6 internal combustion engine (or, in the parlance of our times, ICE). This is in stark contrast to the current (non-hybrid) S 560 4Matic model, which gets a biturbo 4.0-liter V-8. The decrease in displacement yields less power (362 horses from the V-6 versus 463 horses from the V-8) and a slower 0-to-60 mph time (4.9 seconds in the hybrid and 4.6 seconds in the V-8), but all things considered, you’re not giving up a whole lot in the performance department to go hybrid in the S-Class. Top speed is electronically limited at 155 mph., while Merc’s third-generation 9G-Tronic Plus automatic transmission handles the cog swaps. Now let’s talk about the electric half of the hybrid equation. 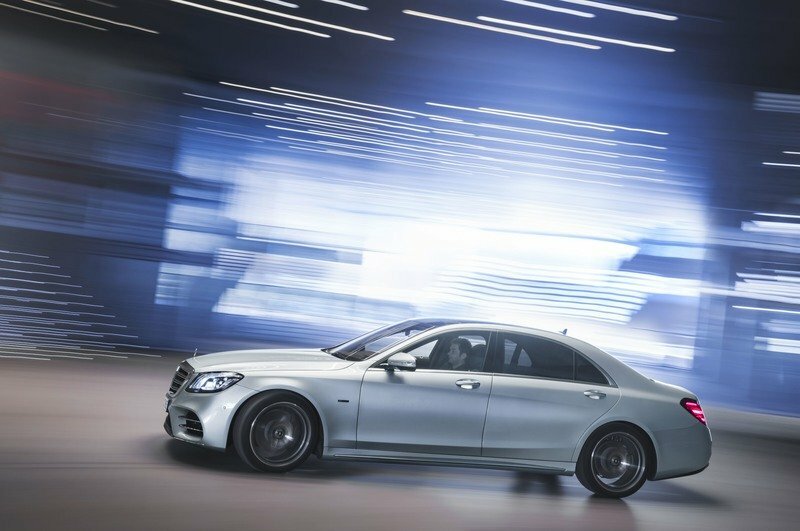 Mercedes partnered with Bosch in the creation of the S 560 e’s specially designed electric motor, which integrates directly with the nine-speed transmission for extra battery-powered motivation. The clutch, torque converter, and electric motor are all contained within a singular hybrid drive unit, with the “separating clutch, torsional vibration damper, and torque converter lock-up clutch [integrated] within the rotor of the electric motor.” The result of all this engineering is a more compact package overall, and thus, more open space for people and things. The S 560 e’s specially designed electric motor integrates directly with the nine-speed transmission for extra battery-powered motivation. The 0-to-60 mph sprint takes 4.9 seconds. Providing the hybrid with juice is an onboard lithium-ion battery pack, which is topped off thanks to the included 7.2-kW charger. The battery pack’s capacity was upgraded to 13.5 kWh for the latest model year. All-electric output (electric motor only, not including the ICE) is rated at 90 kW and 325 pound-feet of torque, while all-electric range comes to 25 miles. While 25 miles might not seem like a whole lot, it’s about right for around-town jaunts and errands. Once the ICE does come into play, the hybrid system makes the most of the available dino juice with a suite of features dubbed Eco Assist. These include the option for “gliding,” whereby the car can coast with “the lowest possible driving resistance when releasing the accelerator.” Basically, that means decoupling the ICE to eliminate engine braking. The system can also recuperate energy over time, and smartly integrates with navigation data (junctions, turns, roundabouts, etc. ), the posted speed limits, the distance to the car ahead on the road, and various other systems in choosing the right group of settings to eke out every last possible MPG. While 25 miles might not seem like a whole lot, it’s about right for around-town jaunts and errands. Once the ICE does come into play, the hybrid system makes the most of the available dino juice with a suite of features dubbed Eco Assist. There’s even a haptic throttle pedal with a variable levels of resistance to help smooth out the driver’s inputs. For example, upon reaching a certain point in the pedal travel, the pushing resistance communicates that the car is maxed out in electric output, with further pushing eventually kicking in the ICE. The throttle will also “pulse” as a recommendation to stop accelerating (it can read speed signs, after all), enabling the ICE to go into glide mode. Once glide mode is active, the driver is notified via the various interior displays. What’s more, if you’re the competitive type, or you’re just into data, the Eco Assist will also record various stats (total all-electric miles, etc.) so you can level up your green game. Finally, Merc has yet to provide updated efficiency stats for the S 560 e Plug-In Hybrid, but did mention it using the European efficiency scales. Combined fuel consumption is rated at 2.1 liter per 100 km, while CO2 emissions are rated at 49 grams per km. 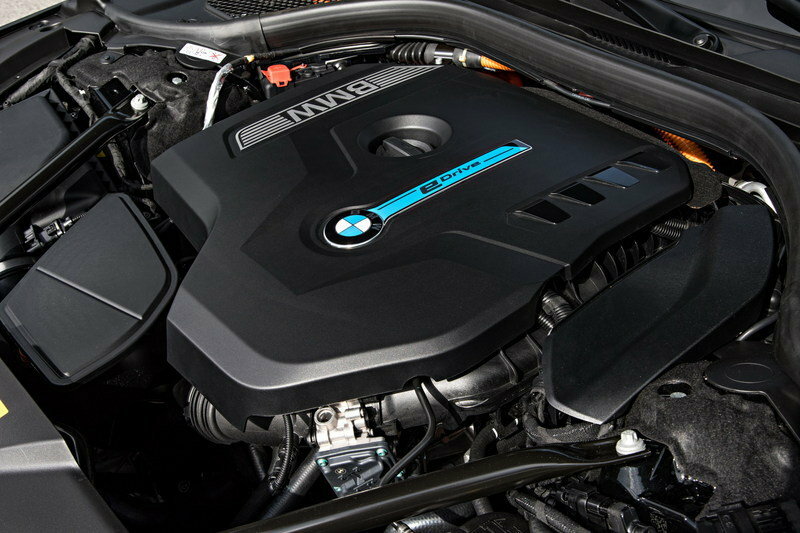 Note: Audi A8 engine (3.0-liter V-6) pictured on the left, BMW 740e xDrive iPerformance engine pictured on the right. 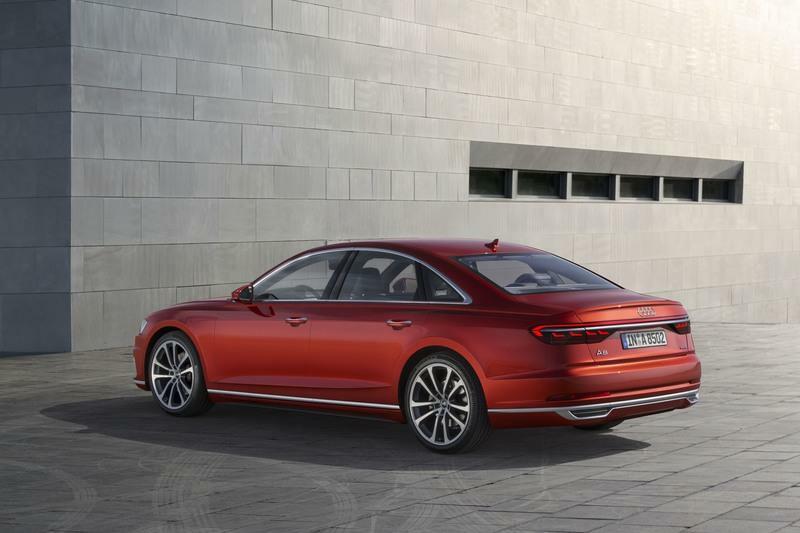 Go for the Audi A8, and you’ll have a broad selection of engine options to choose from, including two six-cylinders, two V-8’s, and even a W-12. When it comes to choosing an appropriate competitor for the above-featured Mercedes, the most obvious choice is the 3.0-liter TFSI V-6 producing 340 horsepower. 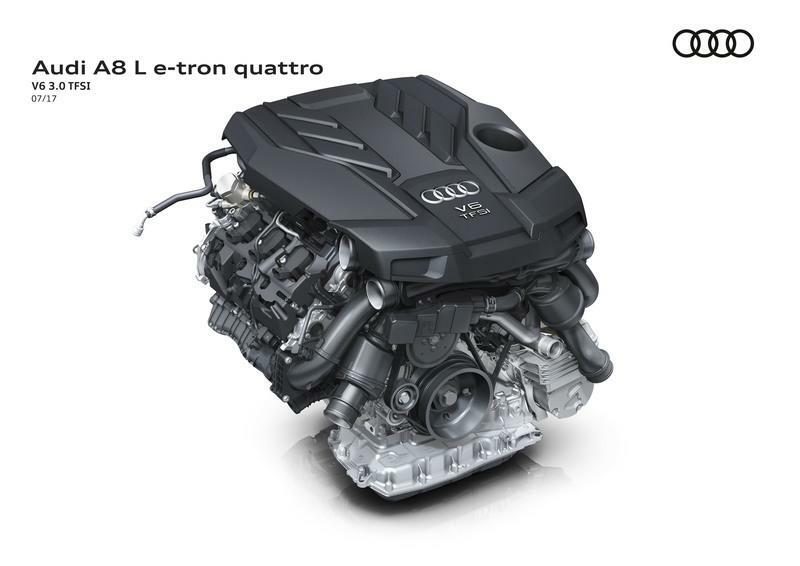 Regardless, all engine options come with something Audi has dubbed “mild hybrid technology,” or MHEV, wherein a 48-volt power system juices the various electronics and starter, making the automatic engine on/off feature more manageable in the long run. It also increases MPG by 0.2 gallons every 100 km (62 miles). We’ll have to wait until Merc gives us some official fuel mileage numbers, but for now, the Bimmer is looking like it’s got the right stuff for hybrid duties. Meanwhile, the Bimmer gets a more dedicated hybrid system, mating a 2.0-liter four-cylinder ICE with an electric motor integrated into the eight-speed automatic transmission. Peak output comes to 258 horsepower and 295 pound-feet of torque, making it the most powerful four-banger BMW has ever equipped in a production vehicle. On its own, the electric motor makes 113 horsepower and 184 pound-feet of torque. A run to 62 mph takes 5.6 seconds. We’ll have to wait until Merc gives us some official fuel mileage numbers, but for now, the Bimmer is looking like it’s got the right stuff for hybrid duties. True, it’s slower than the Merc, but if acceleration is what you’re after, then this probably isn’t the right segment for you. What’s more, the Audi’s MHEV is a rather weak efficiency booster, especially against the Bimmer and updated Mercedes. That’s why we’re gonna give the BMW the nod in this department. Mercedes says the S 560 e is scheduled to hit U.S. dealers in mid 2019. When it does, we’re expecting pricing roughly equivalent to the outgoing S 550 e, which currently starts above the $100,000 mark. That would place it at about the same pricing range as the V-8 powered, 463-horsepower S 560 4Matic. 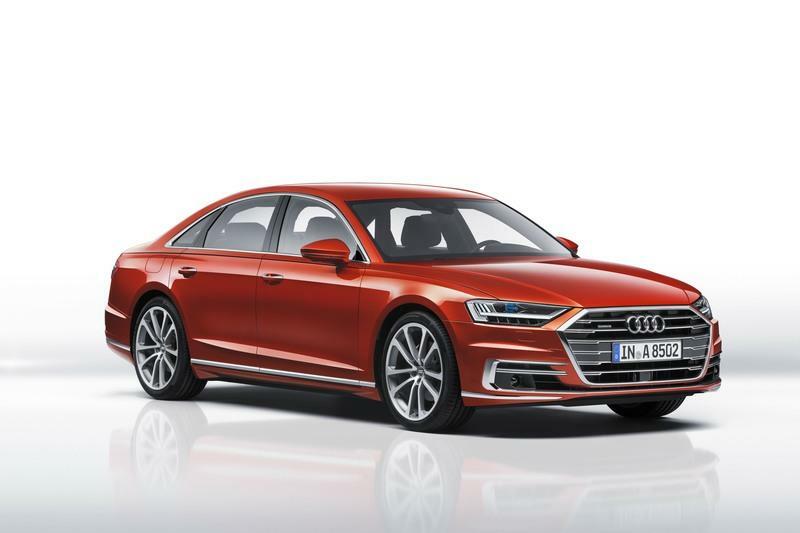 The current Audi A8 starts at $82,500, while the BMW 740e xDrive iPerformance starts at $89,100. If the S 560 e does indeed start at six-figures, it would be the most expensive option here by a long shot. Not including optional equipment, of course. 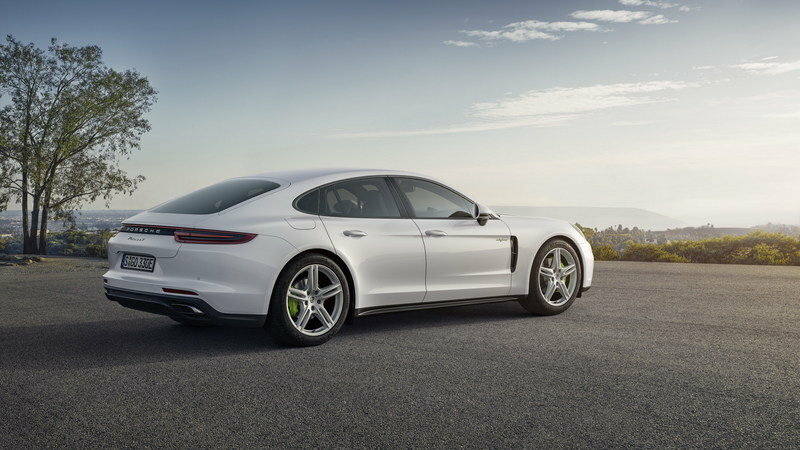 If speed is a major concern, but you still wanna go hybrid, then Porsche has a solution with the Panamera Hybrid. Making the go is a 2.9-liter V-6 ICE, which gets stuffed with air by twin turbochargers and mates with an electric motor and lithium-ion battery pack to spit out as much as 462 horsepower and 516 pound-feet of torque. That’s a substantial amount of thrust, enabling the Panamera to hit 60 mph to hit 60 mph in just 4.4 seconds. Read our full review on the Porsche Panamera 4 E-Hybrid. 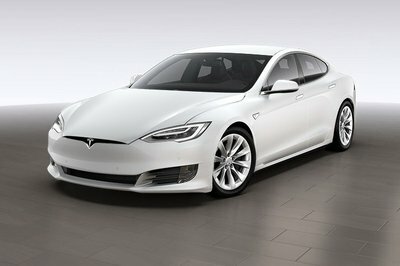 It might not be a hybrid, but the Tesla Model S is still a mainstay of the premium green motoring movement. For much less than the S 560 e, you can get the 75D model, a stout four-door EV making as much as 518 horsepower and 387 pound-feet of torque. All-electric range is rated at 275 miles. All impressive stuff, no doubt, but if you do opt for the Tesla, be prepared to sacrifice cabin features and luxury as well, even if you get the range-topper P100D model. Read our full review on the Tesla Model S.
Without a doubt, there are at least a few of you readers out there that see this thing as rather pointless. After all, what’s the point of adding a hybrid system to a V-6-powered luxury barge? If MPG is what you’re after, then there’s plenty of alternatives out there that offer far more efficiency than the S 560 e.
Thing is, none of those alternatives have the same Mercedes approach to refinement, including the BMW mentioned above. 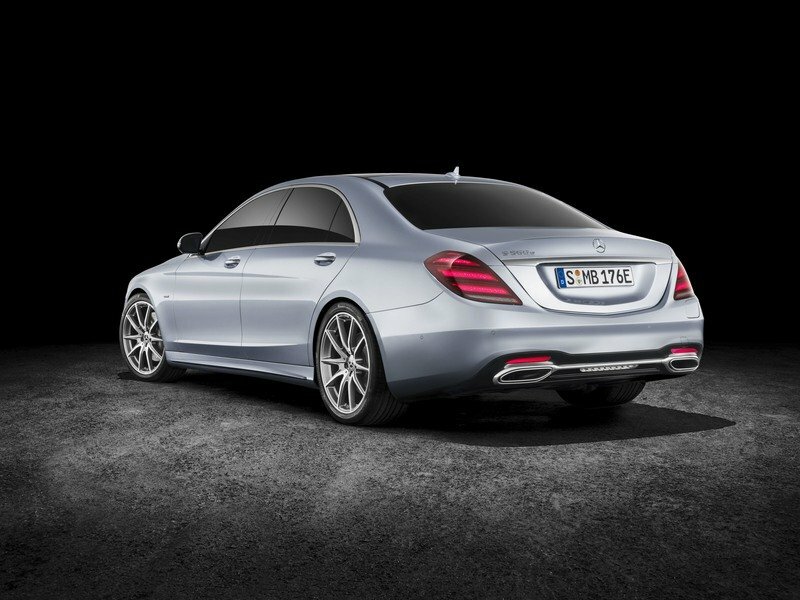 And that’s really what the hybrid S-Class is banking on – brand loyalty and brand recognition. Never mind the numbers – how does the hybrid in question make you feel, and more importantly, does it feel like a Mercedes? Indeed, Merc is betting it’s got that bit on lock. Is it really that efficient? 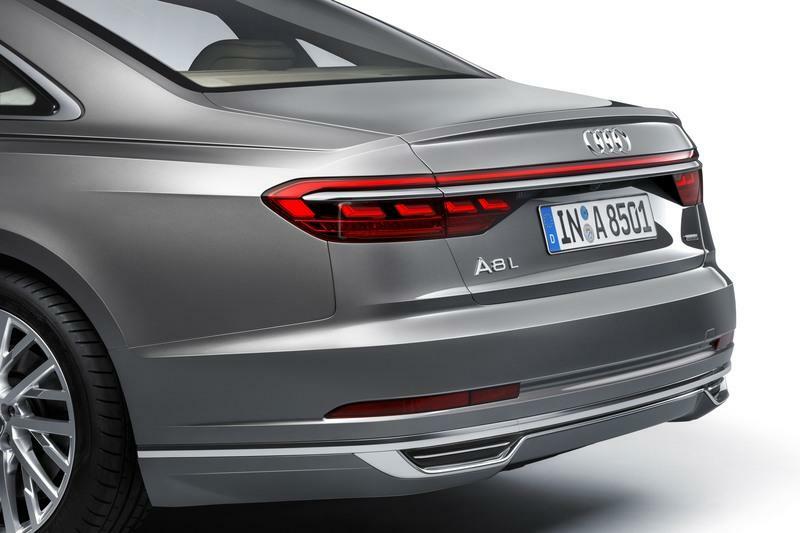 Read our full review on the Audi A8. 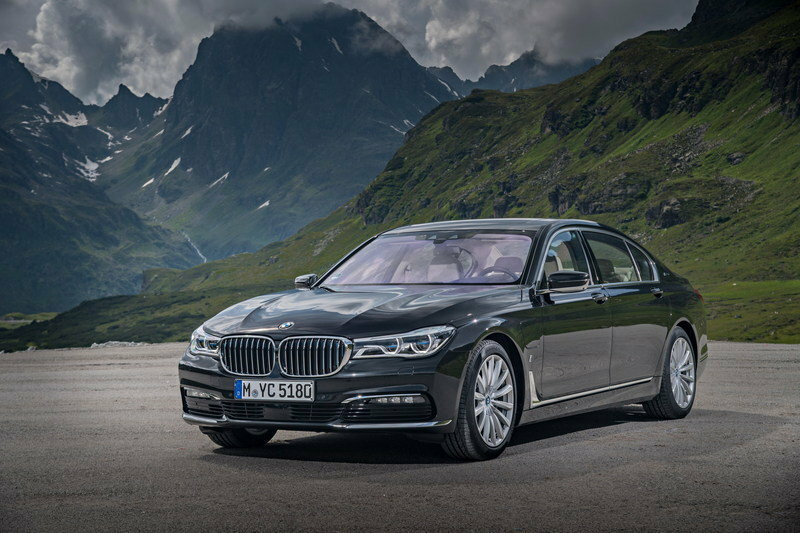 Read our full review on the BMW 740e xDrive iPerformance. The latest addition to the S‑Class family is a new-generation plug-in hybrid. The S 560 e (combined fuel consumption: 2.1 l/100 km, combined CO2 emissions: 49 g/km, weighted power consumption: 15.5 kWh/100 km) has an all-electric range of around 50 kilometres. 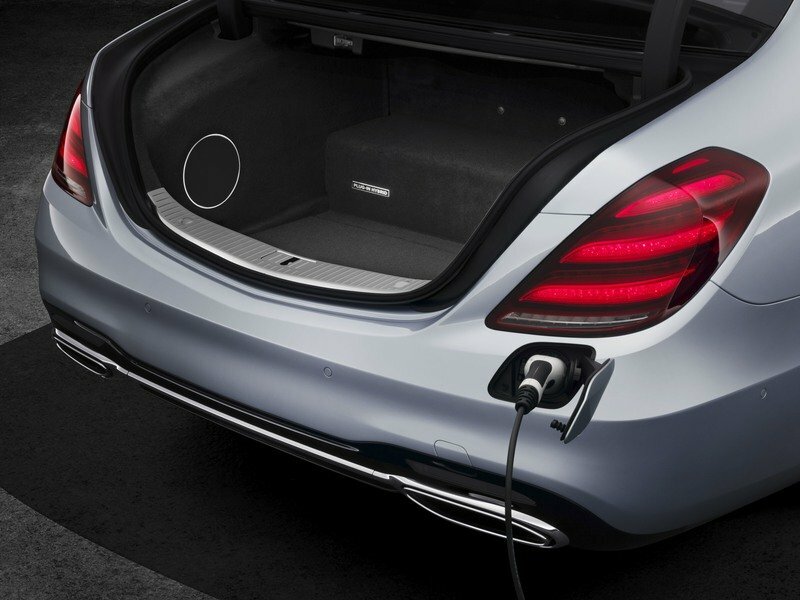 In conjunction with the Mercedes-Benz Wallbox, the on-board 7.2‑kW charger allows fast charging of the battery. Plug-in hybrids represent a key technology on the road to a locally emission-free future for the motor car. This is because they offer customers the best of both worlds; in the city they can drive on battery power alone, while on long journeys they benefit from the combustion engine’s range. Hybridisation also makes the internal combustion engine more efficient, and ensures more dynamic performance. 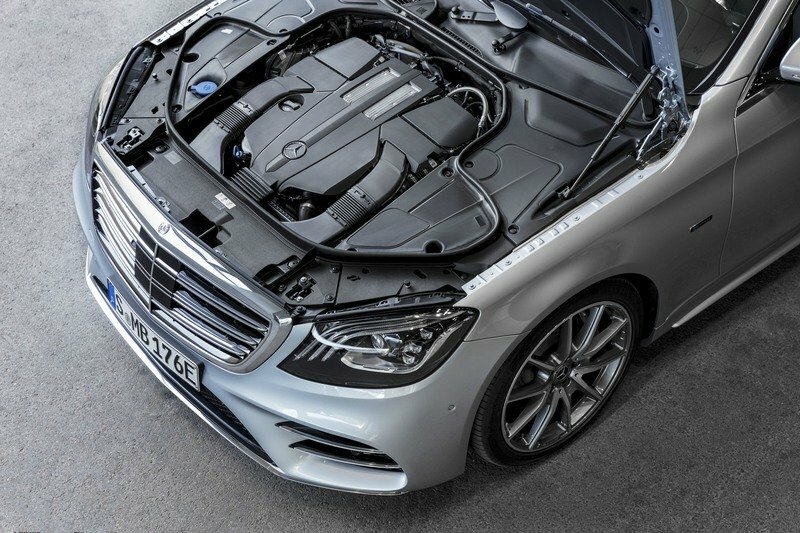 The hybrid drive system in the S 560 e combines the 270 kW (367 hp) of the V6 spark-ignition engine with an electric output of 90 kW. The third-generation hybrid transmission evolved on the basis of the 9G‑TRONIC PLUS automatic transmission. The torque converter, clutch and electric motor are housed in the innovative hybrid drive unit. The compact design was achieved by integrating and connecting the separating clutch, torsional vibration damper and torque converter lock-up clutch within the rotor of the electric motor. The torque converter with its powerful and highly efficient hydraulic circuit offers the customary smoothness when pulling away in hybrid mode. Developed together with Bosch as part of the EM‑motive joint venture, the electric motor was specially designed for the 9G‑T RONIC plug-in hybrid transmission. The new, significantly enhanced power electronics have allowed further increases in output and torque. The electric output of 90 kW and 440 Nm contributes to the effortlessly superior driving sensation in the S‑Class. The S 560 e has an all-electric range of around 50 kilometres. A crucial factor here is that, although the battery size remains unchanged, the new lithium-ion battery has an increased rated capacity of 13.5 kWh. Evolving the cell chemistry from lithium-iron-phosphate (LiFePo) to lithium-nickel-manganese-cobalt (Li-NMC) allowed the cell capacity to be increased from 22 to 37 Ah. The highly efficient battery system in the S‑Class comes, for the first time, from the wholly owned Daimler subsidiary Deutsche ACCUMOTIVE. The power electronics are now housed in the engine compartment. Despite an increase of around 50 percent in its energy content, the dimensions of the new battery are smaller than those of its predecessor. As a result, the boot capacity has increased from 395 to 410 litres. 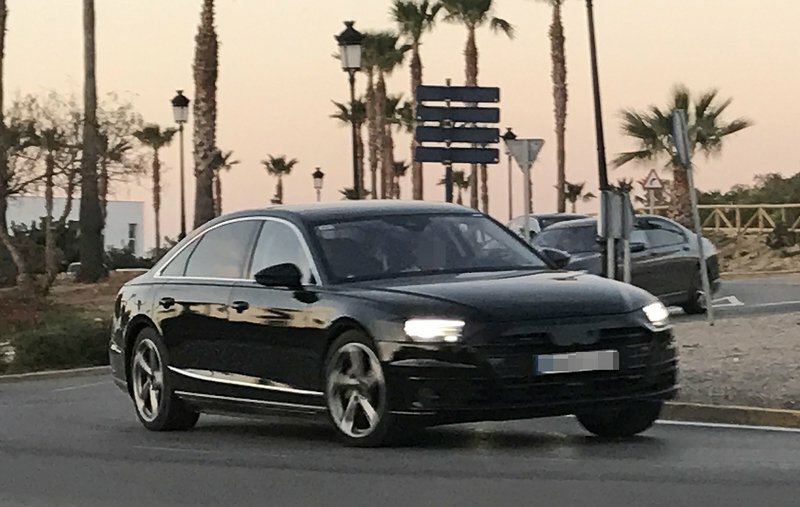 The S 560 e provides comprehensive support to promote anticipatory and economical driving: The driver is prompted when it is appropriate to release the accelerator, e.g. because the S‑Class is approaching a speed limit, and assisted by innovative functions such as gliding and recuperation. To this end, navigation data, traffic sign recognition and information from the intelligent safety assistants (radar and stereo camera) are networked and processed. ECO Assist continuously generates coasting simulations in the background: Depending on the charge level of the battery and the traffic situation, it computes whether the vehicle should ideally be allowed to coast freely ("sail") with the lowest possible driving resistance when releasing the accelerator, or whether it should be decelerated so that the battery can be efficiently charged (recuperation). The haptic accelerator pedal helps the driver to achieve an economical and comfortable driving style. A variable point of resistance in the pedal, for example, indicates to the driver that maximum electric output is being delivered. If the driver continues to depress the pedal beyond this point, the combustion engine kicks in. A noticeable double pulse in the haptic accelerator pedal recommends the driver to take their foot off the accelerator. If the driver follows this recommendation, the combustion engine is switched off and decoupled from the drivetrain. Within the limits of the system, ECO Assist regulates the impetus according to the situation as soon as the driver’s foot leaves the accelerator. The driver is also given a visual prompt to do this by the appearance of a "release accelerator" symbol in the central display (or if installed, in the head-up display). At the same time a graphic gives the driver the reason for the recommendation (e.g. "Junction ahead" or "Gradient ahead"). To increase the driver’s motivation to follow the recommendations of ECO Assist, the on-board computer records how many kilometres/for how much time during a journey the car has been driven with the engine switched off, and shows this in the central display. The reward not only takes the form of reduced fuel consumption, but also of an increased electric range. The standard equipment for the S 560 e is extensive and includes special features such as extended pre-entry climate control. This is target value controlled. In other words, the S‑Class is air-conditioned to the preset temperature ready for the start of the trip, assuming the driver has entered the departure time, for example via Mercedes me. This is possible due to the electrically driven refrigerant compressor and electric heating elements for the heated air. Furthermore, preheating encompasses not just the interior air but also the heated seats, steering wheel and armrests in the doors and centre console, while cooling also activates the seat ventilation if this particular optional extra is fitted. 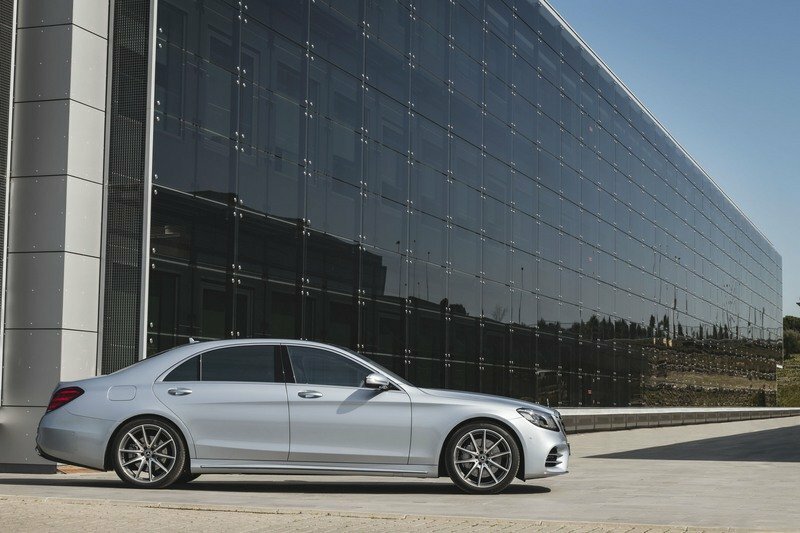 Because the strengths of plug-in hybrids come to the fore in larger vehicles and on mixed route profiles, Mercedes-Benz is opting for this powertrain concept from the C‑Class on up. The strategic hybrid initiative is decisively facilitated by Mercedes-Benz’s intelligent modular hybrid concept: It is scalable to allow it to be transferred to a large number of model series and body styles as well as left- and right-hand-drive variants. 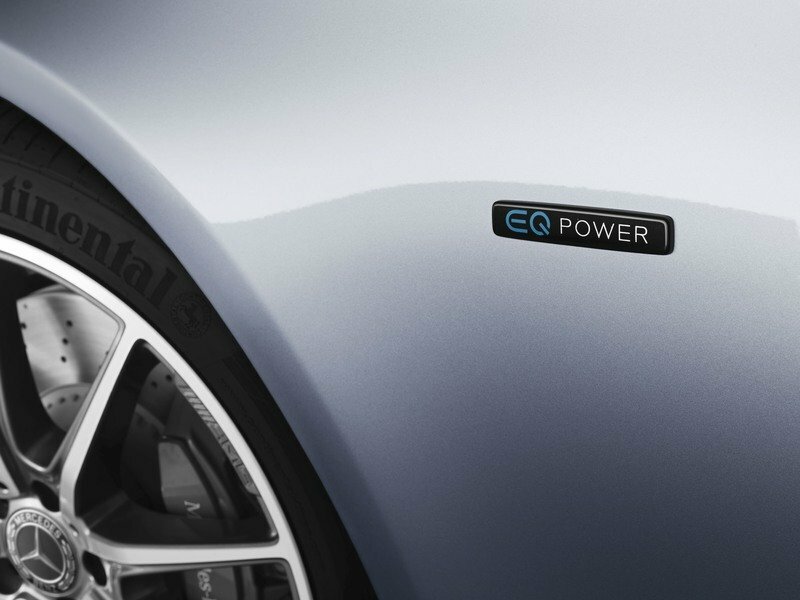 To underline the important role of hybrids in the process of electrifying the car, the Mercedes-Benz plug-in models will, in future, feature the technology badge EQ Power. At present Mercedes-Benz has one of the broadest ranges of plug-in hybrids in the premium segment: following on from the C 350 e (saloon, estate and long version for the Chinese market), the GLE 500 e 4MATIC, the GLC 350 e 4MATIC, the GLC Coupé 350 e 4MATIC and the E 350 e, the new S 560 e – the successor of the S 500 e – is already the eighth plug-in model that Mercedes-Benz is bringing to the market.